Ged is a carer for his son, Shaun, now aged 26, who was diagnosed with Cerebal palsy when he was 18 months-old.
" We were told that Shaun would probably not crawl and would never walk. He would often lie on the floor on his back or his front playing.
" Then one day he just got up and crawled without anyone's help. I can't describe in words how proud I was, and cried tears of joy.As with any child with a disability, each small step and achievement is magnified ten times over and gives a real sense of progress." Ged explained the day-to-day caring tasks he helps with: “The daily tasks for Shaun and me are getting breakfast ready which is Weetabix, Shaun’s favourite- which he has in bed! Then it’s a quick crawl for Shaun to the bathroom for a wash, shave and a teeth brush. Then it’s time to get dressed, down the stairs and out the door. I then drop Shaun off at his learning centre for the day or we go out somewhere if it's the weekend. 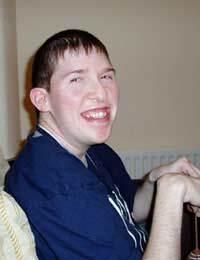 Shaun loves going to the shops or watching his beloved Everton football team- he’s a season ticket holder. “Shaun will never be totally independent, but can do some things on his own. I prepare his meals for him, although his fine motor skills mean he can feed himself, provided you cut up his food for him. “Shaun needs help with his personal hygiene. He cannot bath himself or clean himself after he’s been the toilet. Ged described some of the help Shaun has received over the years: “Disabled facilities for children are widespread, and there is a lot of help and support available. Shaun was lucky enough to get a place at Cavendish School, which is a fantastic special needs school in Runcorn, and his development came on leaps and bounds. Shaun stayed at Cavendish school from the age of 4 to 19. Many of the staff there saw him grow from a baby into a lovely young man. “Shaun now lives semi-independently with two other special needs adults.The level of care when you move in to adult life is quite different. There’s not the same amount of funding, or quality of staff, and I have had some concerns. I’m not scared to voice my opinion and fight Shaun’s corner. After all he can’t do it for himself, and I’m his dad - that’s my job." Ged described how Shaun’s condition has affected both him and Shaun emotionally: “Not being able to do things for himself sometimes frustrates Shaun, but he never moans about it, and gets on with the cards he’s been dealt with.